The Gondola Blog: Regata Storica is Coming! 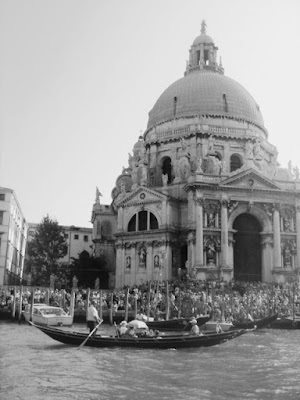 This Sunday, September 7th, Venice's Grand Canal will play host once again to the Regata Storica. This one-day event is one of the biggest happenings on the calendars of most Venetians. They will crowd around any place along the water where they can see the events. A passenger sandolo moves slowly past La Salute as the steps around the church are filled with onlookers. A parade, complete with historical re-enactment vessels and rowers and passengers in costume, will grace the waters. All the rowing clubs, in Venice and the surrounding area, make it a point to be on the water, with as many boats as they can muster. Interesting boats, both privately owned, and club owned, often show up from other parts of Europe. While there are plenty of opportunities in the Venetian Lagoon to see races, the ultimate regata takes place on the first Sunday in September. and the club race on racing gondole. The race that everyone shows up to see, however, is the gondolino race. It's the final race of the day (and of the season). For want of a better comparison, it's the Superbowl of Venetian rowing. The guys who win this race are lifted up as heroes. If you're up during the time of the event, you might be able to catch a few views of the event on some of the webcams mentioned in my post from August 22nd of this year titled "A Whole Bunch of Webcams".